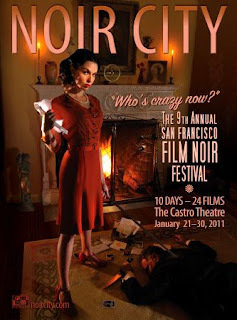 The ninth annual San Francisco film noir festival, Noir City 9, will run from Friday, January 21, through Sunday, January 30, at the historic Castro Theatre; 24 films noir, both celebrated and obscure, will screen. A presentation of the Film Noir Foundation, this festival is the centerpiece of the organization's effort to find and preserve films in danger of irreparable damage. The foundation's advisory council includes best selling novelists James Ellroy and Dennis Lehane, actress Marsha Hunt and film historian/critic Leonard Maltin. Film Noir Foundation founder and president Eddie Muller, known as "the czar of noir," is a writer and filmmaker who frequently speaks at noir screenings. Earlier this year he was a special guest at Robert Osborne's 2010 classic film festival in Athens, GA, where he introduced the screening of Double Indmenity. Muller has also provided commentary on noir DVDs (Fallen Angel, The Lineup, They Live by Night and many others). The Film Noir Foundation also produces festivals in Chicago and Washington, DC. Click here for screening times and pricing. The Stranger on the Third Floor (1940), starring Peter Lorre, considered "the first American film noir"
SF is one of my favorite cities. My wife and I were there in May last year and one of the things I wanted to see was the Castro Theater (I love old movie theaters). Did not get to go inside but I did photograph it. I have seen about seven of the films on this list, especially interested in seeing the Mann and Lang films which I have yet to see. 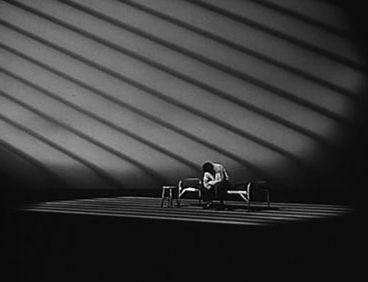 I'm planning to see STRANGER ON THE THIRD FLOOR, STRANGERS IN THE NIGHT (Anthony Mann, one of my favorite noir directors), A DOUBLE LIFE (have never seen it), THE WOMAN ON THE BEACH and, hopefully, BEWARE MY LOVELY...will report back. The Castro hosts many festivals including SF's annual Silent Film Festival, a Berlin festival and is one of the venues for the Int'l. Film Festival. Also screens many classics. Love it. Wish I lived close enough to attend! "A Double Life" features two things I love -- Othello and Ronald Colman. 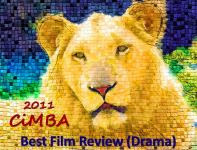 It is a marvelous movie. If you haven't seen it Eve, you have a real treat in store!